From Dijon to Santenay, La Route des Grands Crus offers some unforgettable moments. This exceptional itinerary invites you to discover the Côte de Nuits and the Côte de Beaune, and to sample some great Bourgogne wines. After meeting the local winegrowers and négociants, you can also visit the celebrated Hospices de Beaune or take a stroll along some pretty paths through the vines. This ancient estate is easy to find on La Route des Grands Crus, and was the property of the monks of Cîteaux until the French Revolution. Since 1944, it has been home to the Confrérie des Chevaliers du Tastevin, which now has some 12,000 members. The Confrérie hosts its chapters here 16 times a year. These prestigious events involve gourmet banquets with several hundred guests, who celebrate the wines of the Bourgogne region and perpetuate a tradition of hospitality and generosity. Aloxe-Corton, Richebourg, Pommard, Nuits-Saint-Georges, Gevrey-Chambertin, Meursault, Puligny-Montrachet and Romanée-Conti. Between Dijon and Santenay take La Route Touristique des Grands Crus and discover these prestigious wines with their aromatic richness and their purple or golden color. At just over 1.5 hours by train from Paris, this legendary itinerary passes through 31 typically Bourguignon towns and villages, and opens the way to a world-renowned winegrowing region. 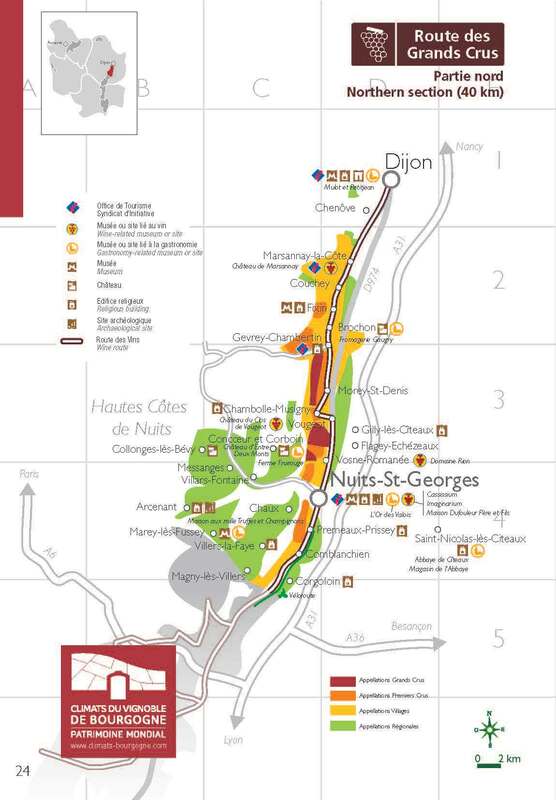 As soon as you leave Dijon, you are on the Côte de Nuits with its gently sloping plots. This is the cradle for many Grand and Premier Cru wines. 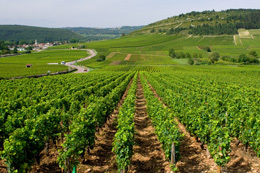 Nicknamed the Champs-Elysées of the Bourgogne region, in parts, it is no more than 300 meters wide, and brings together a host of world-famous Climats. 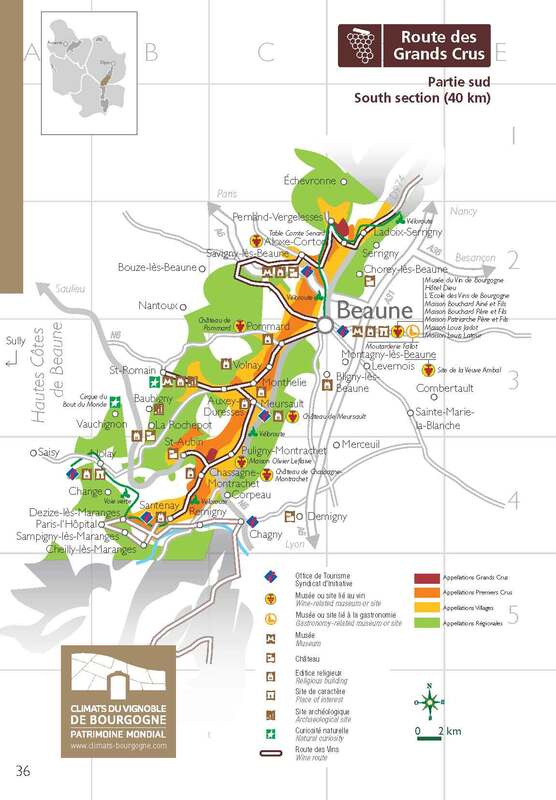 To the south of Ladoix-Serrigny, the trail continues on the Côte de Beaune, with its gentle slopes and Bourgogne traditions. Take the time to visit some cellars or maisons de négoce – year-round, the winemakers will share their expertise and love of the Bourgogne landscape with you, and of course will invite you to taste their wines. During your trip along La Route des Grands Crus, the Vignobles & Découvertes label will guide you to the region’s must-see places. ♦ In Dijon,follow the Owl Trail which will lead you on a fantastic trip through 22 of the city’s historic sites. ♦ In Nuits-Saint-Georges, visit the Imaginarium, a fascinating exhibition space for the whole family. It offers two fun exhibitions that reveal all the mysteries of wine production, both still and sparkling. ♦ In Beaune, make sure you call in at the Hôtel-Dieu. This former hospital is the main site of the celebrated Hospices de Beaune, founded in 1443 by Nicolas Rollin, chancellor to the Duke of Bourgogne. This imposing building has some fabulous gothic towers, richly colorful roofs and superb Medieval collections. La Route des Grands Crus also offers the occasion to admire some unique landscapes, such as the cliffs of Saint-Romain, near to Meursault, or the Comblanchien quarries near Nuits-Saint-Georges. There are plenty of beautiful vineyards along the 150km of footpaths dedicated to hiking fans. Perhaps you prefer to do your exploring on two wheels ? Over 23km between Beaune and Santenay, the famous Véloroute will not fail to delight. Or you can travel La Route des Grands Crus on horseback, by little train, on a Solex or a gyropod (a small one-man electric vehicle on which one stands upright). And why not fly overhead in a hot-air balloon or take a helicopter ride ? Along this exceptional path, the locals will also delight in sharing their festivities with you. All year round, from village to village, savor the good fun of these joyous get-togethers. To organize your trip, contact the Côte-d’Or Tourist Board.